The NFL will discuss the issue of players kneeling during the United States national anthem when it meets in New York next week. NFL commissioner Roger Goodell says disputes over the protests threaten "to erode the game's unifying power" and called on clubs to resolve the issue. Goodell said the anthem controversy was a "barrier to honest conversations and making real progress". In a letter sent to NFL teams, he added: "Like many of our fans, we believe that everyone should stand for the national anthem. It is an important moment in our game. "We want to honour our flag and our country, and our fans expect that of us. "We also care deeply about our players and respect their opinions and concerns about critical social issues." 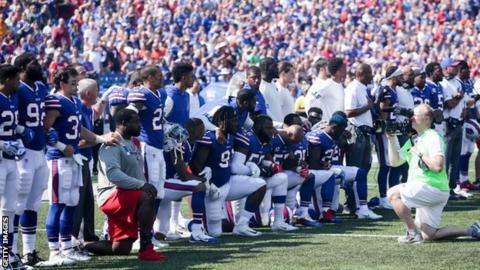 However, President Donald Trump has criticised players for the protests and pressed the NFL to ban them. Goodell said the NFL had heard from players at its September meeting about why the issues were so important to them and how the NFL could support them. In the letter, he added: "Everyone involved in the game needs to come together on a path forward to continue to be a force for good within our communities, protect the game and preserve our relationship with fans throughout the country.